There’s hope for childhood. Despite a perfect storm of hostile forces that are robbing children of a healthy childhood, courageous parents and teachers who know what’s best for children are turning the tide. Johann Christoph Arnold, whose books on education, parenting, and relationships have helped more than a million readers through life’s challenges, draws on the stories and voices of parents and educators on the ground, and a wealth of personal experience. He surveys the drastic changes in the lives of children, but also the groundswell of grassroots advocacy and action that he believes will lead to the triumph of common sense and time-tested wisdom. Arnold takes on technology, standardized testing, overstimulation, academic pressure, marketing to children, over-diagnosis and much more, calling on everyone who loves children to combat these threats to childhood and find creative ways to help children flourish. Every parent, teacher, and childcare provider has the power to make a difference, by giving children time to play, access to nature, and personal attention, and most of all, by defending their right to remain children. The excerpt above was found on the first page of the first chapter. As the page continues, I am reminded of another point – “In the midst of our complex lives, we must make time to take in the lessons that only children can teach.” This quote is remarkably true! I am the parent and the teacher, but sometimes my children become the teacher and I the student. How often have we, as parents, set out to teach our children a life lesson, but the lesson is reversed and it is our children who teach us? The author states that children demand honesty and simplicity. Children expect our words to line up with deeds. Lately, my children have been faced with examples from adults whose words did not line up with actions at times. Needless to say, it has been challenging for me and my children. My oldest is now mature enough to notice these things. He often wondered why his dad and I are such sticklers for certain character traits. An example is to say what you mean and mean what you say. Unfortunately, he has personally witnessed how the world can be with others who do not value the same beliefs such as honesty. The first chapter focuses on how much the world needs children. Allow me to repeat that the world needs children. We need children and we need to embrace children, for they are the future. However, the future often looks bleak. Society has shown a decline of tolerance and acceptance for children. In other areas of the world, despite very little funding for education or materials, children and teachers have a great determination! Some children walk miles just for the privilege of an education. The determination of an education overpowered the hunger they sometimes felt. Their eyes shone with ambition as they sang songs. However, one thing to be noted is that in these impoverished countries, where they are so very poor, children are valued! They are a treasure! These children represent the future of their civilization and their family names. As I was reading I began to wonder, when did society begin to drift away from viewing children as a blessing? When did we start viewing children as a burden? Why has this shift occurred in an economic society like America but in impoverished countries children are not just valued and loved, they are treasured? We all recognize the spirit within the home is the most important influence in the growth of the child. In family life the child should first learn confidence in his own powers, respect for the feelings and the rights of others, the feeling of security and mutual good will, and faith in God. Mothers and fathers, by the kind of life they build within the four walls of the home, are largely responsible for the further social and public life of the country. Just as we cannot take care of the child apart from the family, so his welfare is bound up with a lot of other institutions that influence his development-the school, the church, the agencies that offer useful interests for lea sure time….And the money and hard work that go into these public and private enterprises are, again, repaid many times. As a nation, how far from this vision have we strayed? In my experience as a homeschool mom, it takes courage raising children and educating them is hard work! That hard work results in tremendous rewards! It is surely God’s work and a mission in itself. Parents and teachers can leave a legacy that will not be forgotten. However, it cannot stop there though. 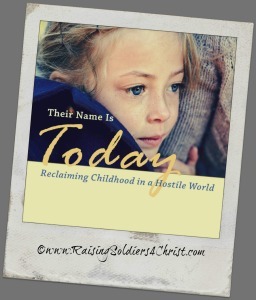 I encourage you to read “Their Name is Today” and find out more!!! This is an excellent book you will want in your library! I highly recommend it to any homeschool and public school parent. For my subscribers, here is your chance to enter the giveaway for a free copy of this book. If you are reading this but are not subscribed to this blog, don’t despair! Just go to the top of the page and enter your email to subscribe!! Super easy! Just make sure that you confirm the subscription in your email.